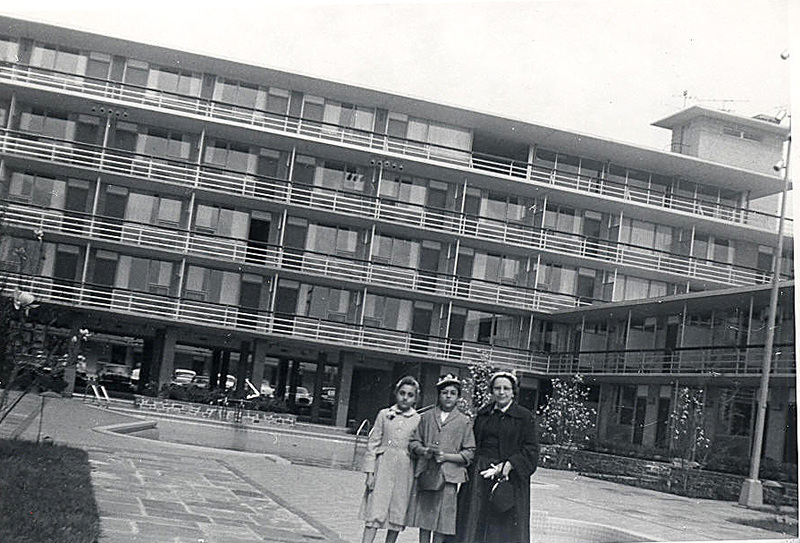 1957 - Easter Sunday at the new 14th Street Bridge Marriott hotel -- a big, sprawling complex. It was very nice place -- we saw it being constructed. which may have been the architect's intention, as it was so close to National Airport. Crystal City had NOT been developed yet. The 14th Street Bridge Marriott hotel had a good restaurant and good conference facilities back then. who paid us a visit from her home in the Bronx. To get to this hotel, the #16 bus (which in those days ran from Annandale or Culmore to 12th and Pennsylvania Avenue and back) would stop near the 14th street Bridge. After getting off the bus, you could walk along the grass or under a tunnel to get to the hotel. This hotel was torn down around 1994.
the Northbound and Southbound 14th Street bridges. This restaurant was very popular too, but was also torn down around 1994. There used to be lots of wild rosesbushes growing in that area too.